Rubies are a variety of corundum, as are sapphires; the colors differ depending on the impurities and elements in the gems. Corundum is the hardest mineral after diamonds. Both natural and synthetic rubies are used in lasers, watches, and medical instruments. 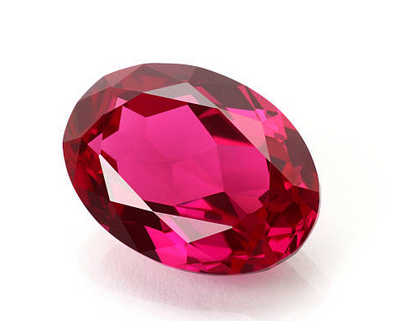 The name ruby comes from rubeus, the Latin word for red. 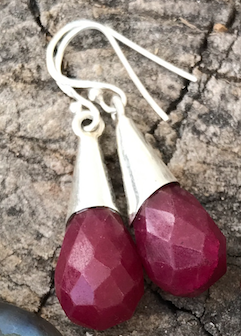 In Sanskrit, ruby translated to ratnaraj, meaning “king of precious stones.” Representing love, passion, courage, and emotion, it was believed that wearing a ruby would bring good fortune, success, and love. Ancient Hindus offered rubies to Krishna in hopes that they would be reborn as emperors, and in Hindu folklore, the glow in rubies was able to boil water. Greek legends said that the warmth of the ruby could melt wax. 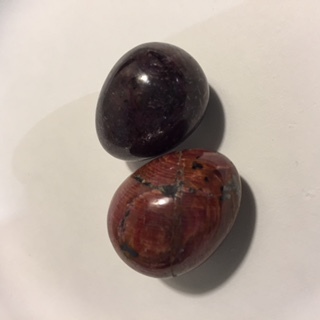 Burma is known for its fabulous rubies, and warriors there would implant the blood-red gems into their skin for protection and courage on the battlefield. Chinese noblemen used rubies in their armor for protection, and buried rubies under buildings to attract good fortune. Because of its blood-red color, ruby has been associated with blood’s life force and it is believed to increase vitality. Its connection to love and passion makes it a popular wedding gem. 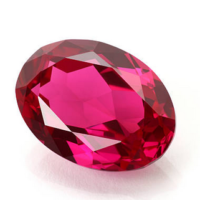 How can you tell if a ruby is real or not? Thanks to the DetactaFake website, I just learned a few ways. Some involve a jeweler’s loupe, which not all of us have ready at hand, to check for the inclusions and lines that exist in real rubies. If you see bubbles (!) then that indicates a “lead glass filled ruby” or “composite ruby” and…nope. Another way is to scratch the stone (where it wouldn’t show). Rubies are second only to diamonds in hardness, and real rubies wouldn’t be scratched. But here’s the coolest and easiest way low-tech, but hey, it works! ): breathe on it as if you were trying to fog a mirror or clean your glasses. If it’s a real ruby, the condensation should start to evaporate after about two seconds, and evaporate quickly, in about one more second. If it’s not a real ruby, it will take much longer to start the evaporation process, and the process will go more slowly. Ruby stimulates, balances, and protects the heart and the heart chakra. It is a stone of nobility, courage, and energy, and helps you let go of the need to feel like a martyr. It’s the perfect gemstone to wear or carry when you need courage. And, even when not gem quality, the stone is beautiful!